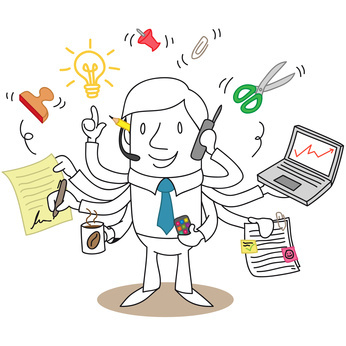 Common Sense and Service Management: Multi-tasking - just a nice name for a short attention span? Multi-tasking - just a nice name for a short attention span? I am a dedicated multi-tasker...always have been. But sometimes I do question the productivity statistics of working the way I do. My brain often seems to race away at 100 miles an hour in a multitude of directions. A good example can be illustrated by my past 5 minutes. I am sitting here (actually, that is a fib, I am in bed with my laptop) and was reading a Twitter stream, I came across an article that looked interesting - How I automated the boring parts of life, by Steve Corona - so I started reading it. A couple of paragraphs in he talked about Amazon orders, so I suddenly thought "I wonder where the Christmas present I ordered for Katie is", so I opened another tab and headed to my account page to check the tracking on the order...but before I got there I noticed that there was a book suggestion for me about copywriting for search engine optimisation, only $4.99, so I sidetracked to order that in Kindle format. Then I thought "maybe multitasking is a good topic for a blog", so here I am! Actually halfway through this paragraph I remembered about the order status check I was doing, so I left mid sentence to check that out as well, the doll I ordered should be delivered tomorrow! So is this an effective way to work? Well, in five minutes I managed to speed read a blog and send it to Evernote to look at more closely later, order a book that I hope will be useful to me and send it to my Kindle, find out that I need to let my husband know that a parcel should be arriving tomorrow and he needs to be around to sign for it, since I am away from home, and I got this blog entry started. I don't think that is bad for five minutes work, when all I had planned to do was read a few tweets then turn out the lights and go to sleep. I have always worked this way, for me it staves off boredom, and for my employers it has always produced good results. When I was on the service desk I could easily work on multiple tickets at the same time, setting a script running for one then going and writing a set of instructions for another while that was running, and at the same time throwing suggestions to other team members. The idea of sitting down and concentrating on a single task really is foreign to me, I need to have at least a couple of things to provide a bit of distraction. So what I have learned are some tactics that let this work for me. I make sure, when I sit down at my desk for a day's work, that I have my main piece of work - at the moment this is editing an exciting new book by Peter Brooks on integrating Service Management and Business Analysis (and yes I do really mean it is exciting, there are some really good new concepts and original thought in this volume) - along with a couple of minor tasks that need to be done. Now editing is an all consuming activity, if you don't remain focused then you are apt to miss things that, once the book is in print, will jump out and hit you and make you think "how the #$%* did I miss that?" Spending too long on task makes my mind go a bit foggy, and it starts to wander. For me a change is as good as a rest, so rather than stop working I will just flick my gaze to one of the other jobs at hand...today that is finishing off a few chapters of a training course on digital publishing, and some fairly mindless administration tasks that just have to be done. I write the three or four things that I need to get done on a piece of paper and pin it somewhere in my line of sight, so by the end of the day I should have the minor tasks completed and be moving through the major job. Having those smaller tasks staring me in the face stops me from flicking into a game of solitaire or sudoku when my brain needs a change and lets me do something productive instead. Sometimes I do wish I was a single-focus sort of girl who could concentrate on one job until that was done before moving on to the next, but it just doesn't work for me. I think maybe that is why I am enjoying my journey into Social Media so much...I love the multiple streams of information that converge on me, right now I have my personal Facebook tab open as well as the Back2ITSM group in another tab, my general Twitter feed is on one tab and a search for #copywriting in another and #ITSM in the next - I have been flicking into these tabs all the time I have been writing this entry. I used to spend hours in the library just looking for interesting stuff to learn, now it all comes to me, and I love it! If you ever want a good team member for a pub quiz, I'm it, my mind is full of useless information! Well, I just did it again, got halfway through doing a re-read of what I have written here and was reminded of what started all this off, so I have just spent 10 minutes reading the article that started this chain reaction, I won't tell you how much time I spent checking out the links to services that were included there...I guess my grandmother was right all along - I am a flibbertigibbet! So, back to my original question...is this an effective way to work, or am I just allowing a short attention span to get the better of me? I don't think so, I have a very high work rate, and I turn out (I hope!) high quality material, on time (I'm daily newspaper trained...deadlines are everything). Maybe I am just trying to justify a rather erratic (or maybe eccentric) mind. I would really love some feedback on different working styles...what tactics do you use to make your personal mode of operation work for you, and for whoever writes the cheques that pay your bills?